On Friday afternoon, our Internet's phone line went dead! *Gaaahhhhhh* I was left to depend on the data plan on my phone to have access to the Internet for the long weekend. Yes, I did freak out for a while but soon I decided to go with the flow, and calmed down. 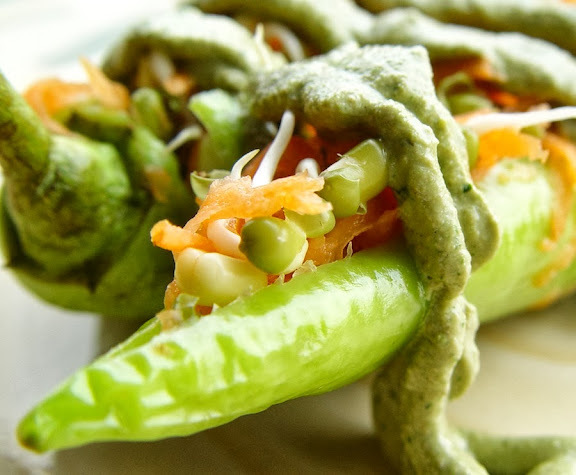 Today I'm back with a very special recipe I put together, Stuffed Bajji Menasinakayi with Walnut Cilantro Pesto. This recipe could work with any kind of Chilli Peppers, but I decided to use these because they are very easily available locally (they're commonly used to make deep fried snacks called Bajjis), are the perfect size for stuffing and can be enjoyed raw because they are not overly spicy. Before I move on to the recipe, I just have to make an appeal. My fellow Vegan MoFo-ers, if you have Captcha Text/Word Verification for commenting on your blogs, please, please, please disable it! At least during MoFo. It's such a slow, painful, annoying process to go through when someone wants to leave nice comments on your blog posts. If you're wondering why you have so few comments on your posts, it's very likely because of that darned Word Verification. Try disabling it for a while and see what a huge difference it will make. And if you're worried about those pesky spammers, just put your comments on moderation like most of us have. That way, you can publish the genuine comments and report the spam ones. * Mix, cover and keep aside for half an hour for the flavours to blend. 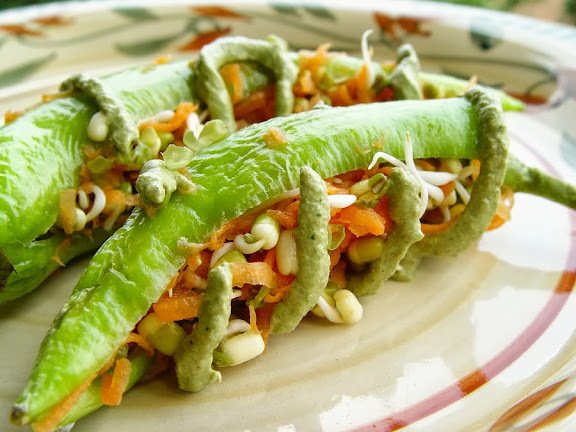 * Make long, lengthwise slits in the peppers and carefully scoop out the seeds using a spoon. * Save the seeds for the pesto and keep the peppers aside. * Add a little water and blend well into a creamy paste. * Stuff the hollowed out chillies with the sprout mixture. * Place them on a plate and pour oodles of pesto over them. This sounds so good! I love mixing up my herbs in pesto but never thought to try using cilantro. It's on my to do list now! The cilantro in the sauce reminded me of my favorite cilantro chutney I get at Indian restaurants. 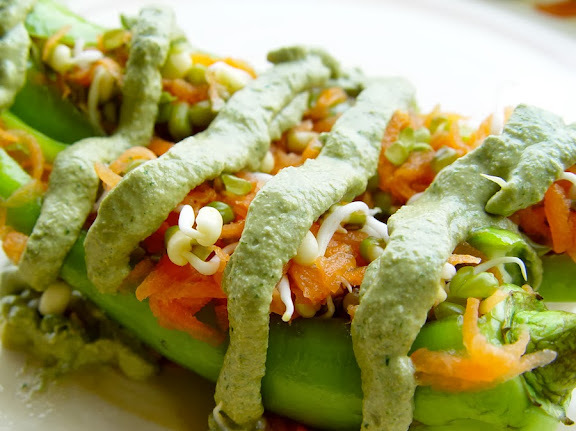 Do you have a favorite recipe for making cilantro chutney at home? I've tried one or two in the past, but my results have been lackluster. For a good cilantro chutney, it's nice to add something sour and a dash if sweetness in there. Makes a big difference in taste. those stuffed peppers look so good with all that creamy pesto. :) i hear you about word verification. I am glad you decided to keep the internet shut down from the monsters. Oh no about the Internet phone. I had that happened before in Colombia, it was really annoying without the Internet and the phone for about 3 days - I couldn't even contact the landlord/host about the Internet issues, but thankfully there is a free public Wi-Fi nearby. Beautiful dish, I've never heard of Bajji Menasinakayi (I hope I spelled it right! ), but the walnut-cilantro pesto sounds heavenly delish! Thanks for the awesome video. Bajji Menasinakayi is the local term for these chilli peppers. I googled them before writing out the blog post and learnt they're called Banana Peppers in English. Love your Mung Sprouts. They are so tasty and I love the look as well. What a creative recipe! I love how there are an infinite number of ways to put simple ingredients together to make a great dish. Thanks for sharing. Thanks. :) I totally hear you! I feel the same way too. I have been appreciating this fact especially now since I'm pushing myself out of my comfort zone to create all raw recipes for MoFo. So gorgeous, Susmitha! Glad you bravely persevered despite the Internet problems (grrr!). And yes, ma'am! Hate that Captcha! Looks beautiful - walnut and coriander are just made for each other! Delicious! Must go find the mild chillies. I usually only buy the really spicy ones because a chilli is meant to be hot! :) Love the recipe. I'm sure this recipe could be tried with spicy chillies too, Rithika. :) Just use lesser seeds in the pesto.